Last weekend I traveled over to Seattle for a two-day workshop by Patricia Belyea on piecing complex curves. I only attend hands-on programs every few years so this was a special experience for me. In the past year or so, I noticed a real ‘urge to piece’ rather than relying upon fused appliqué in my art quilts. Couple that with an increasing desire to quilt children’s quilts for Quilts Beyond Borders and attending a program on piecing curves seemed a good idea. I had met Patricia at a conference in Takoma, WA several years ago and liked her. I thought I could learn from her so I took the plunge and indulged myself. I can say that I was definitely pleased with the workshop. It was held in her ‘store’ in the basement of her house so the workshop space was small but, with only five participants, it was fine. Everything was provided from machines to lunch – we only were asked to bring fabric. As if to enhance our learning experience, we were surrounded by shelves of the Yukata cotton that Patricia sells. Patricia is an organizer at heart as well as a designer and this was probably one of the most well thought out workshops I have ever attended. She provided excellent teaching materials which we could take home and spaced out the teaching elements over the two days. There was plenty of leeway for each of us to proceed at our own comfort pace and Patricia was always at our sides if we asked for help, or if she, almost magically, sensed before us that we needed some guidance. 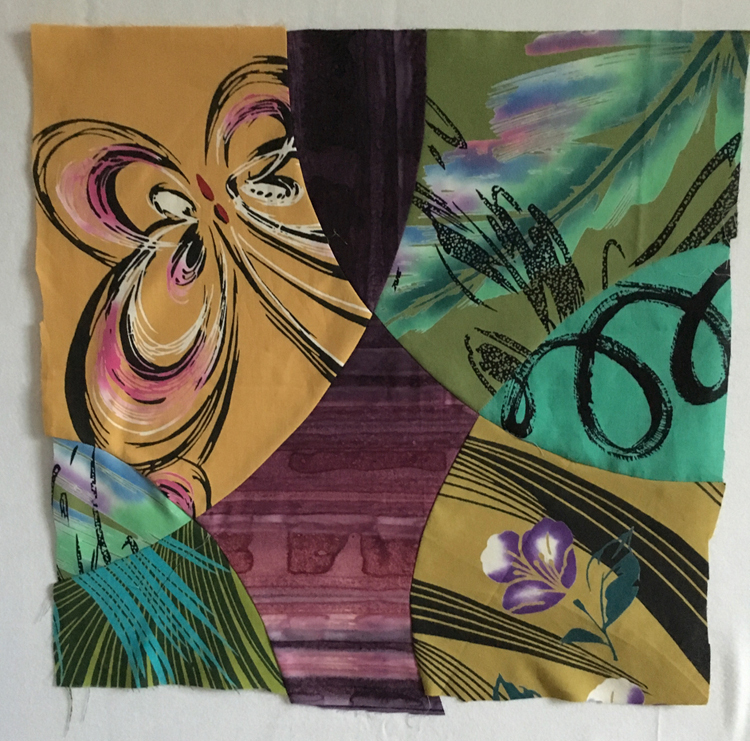 I used Yukata cottons for the workshop – not a requirement – but since Patricia has focused on using Yukata in her own extensive work, I decided to follow suit while learning from her. I knew that would be a stretch for me as my own tastes tend more towards batiks but it was a good decision as I discovered how easy the cotton was to work with. We progressed over two days from sketching a curved pattern, transferring it to freezer paper, cutting and finally stitching using Patricia’s method. 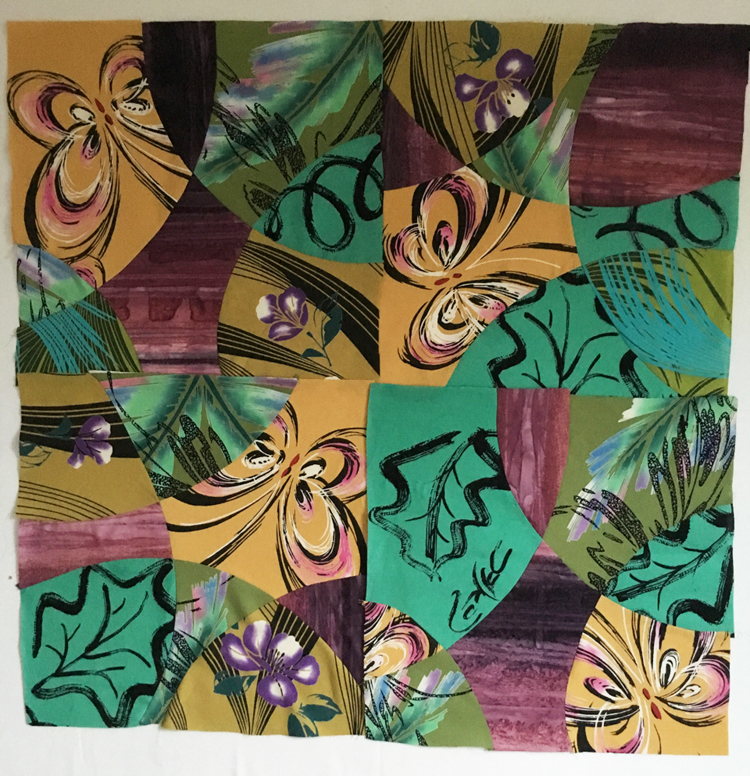 Each of us created unique well executed 18″ quilt blocks that lay perfectly flat. Since I remembered frustrations years ago with piecing a sketch and getting it to lie flat, I was really delighted with my results. I think it is a mark of Patricia’s skill as an instructor that each of us experienced success. For me the real test was could I go home and have as much success as I did at the workshop. I had completed two blocks and cut pieces for a third before I left Seattle. Since I returned home I have been able to stitch together the third block and also complete a fourth block competently. What will I do with the four blocks and what is the real value of the class for me? I suspect the four blocks will be transformed into a set pillows. This reflects the fact that I was focusing upon technique in constructing the blocks….when I create art quilts, I prefer to start with a vision or a message that the piece is meant to convey so I can’t quite envision the blocks up on one of my walls. However I did enjoy working with the cotton and looking through Patricia’s huge inventory in person, I did purchase a few as ‘they spoke to me’ so I am sure Yukata will be sneaking into my future projects. The real value of the weekend is some new insights into piecing curves in a composition and taking the technique forward into other areas. We had a glimpse of the potential towards the end of the workshop as Patricia shared her efforts with inset circles and curvy lines. Without a doubt, this is what made the workshop a huge success for me. I know I have learned the basics and I am sure I can adapt the process to enhance my own art. It is always exciting to be exposed to new ideas …….I firmly believe it is what keeps us young at heart. If you are interested in learning more about piecing with curves, I hope you will check out Patricia’s workshops. They sell out early so you need to plan ahead! Linking to Nina Marie’s Off the Wall Friday so you can see what other artists are up to. A very valuable skill to have and you have shown that you learned it well. I’m sure it will come in handy, too.